Is he Willoughby or is he Hillenkoetter, or neither? In 1950, as General MacArthur’s forces advanced on the Yalu River, his intelligence head, General Charles Willoughby, dismissed information that Chinese “volunteer” forces were already in Korea, buttressing MacArthur’s determination to drive to the Chinese border. In contrast, CIA head Admiral Roscoe Hillenkoetter, warned of a significant threat from the Chinese. In line with his previous treatment of the OSS, MacArthur froze the CIA out of East Asia. The rest is history. In his meeting with President Truman at Wake Island, MacArthur claimed that the Chinese could not field more than 50,000 at a time when nearly 260,000 troops had already entered Korea. As allied forces approached the Yalu, the Chinese struck. The result was a disaster. 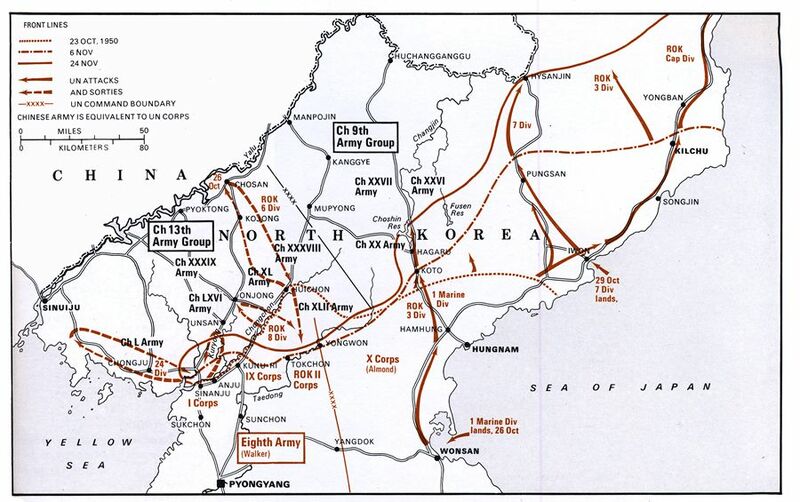 The Eighth Army was routed again and its South Korean allies destroyed. Thousands of allied troops died and were wounded. (Recent pop culture reference, here). It’s always dangerous to reason by historical analogues (see review of Neutstadt/May), but perhaps it’s useful to highlight parallels. A tendency to dismiss the idea the Chinese will retaliate. Insulation of the advisory process from the rest of the relevant bureaucracy. Dismissal of the idea of effective retaliation, even if the other side decides to strike. Over-optimism of the efficacy of forces as hand, as compared to those of the opposing side. So, is Kudlow Willoughby. Or, in internal deliberations, is he Hillenkoetter? Or is he merely a cipher? And is Trump MacArthur (the MacArthur of late 1950, when he was nearly 71, and not the MacArthur of Corregidor)? More on stumbling to trade war, here. This entry was posted on August 4, 2018 by Menzie Chinn. Kudlow is the furthest thing from Hillenkoetter for 2 reasons. Kudlow is not bright enough to give any President credible advice. But more importantly Kudlow all his life has kissed up to his political masters. Kudlow kisses up to Trump as that is what Trump wants. Ever wonder why Kudlow did not have a job at the CEA or NEC under Reagan, Bush41, or Bush43? As much as I disagreed with the economic policies of the previous GOP Presidents, they at least wanted honest advisers. Trump wants fan boys which is why Kudlow has his job. I suggest Haberstam’s The Coldest Winter…….. The civilian citizenry elected leadership must always have control over the military, for we all know what happens when it doesn’t. I’m trying to think of other suitable examples. Pat Buchanan to Richard Nixon might be analogous. On an “it’s all about me” note, I once shook the hand of a Chinese man who was a pilot for China during the Korean war. His son was a colleague of mine at a Chinese University. The odd thing was, it was after I had had a work related quarrel with the son (that we had not resolved and probably never would resolve), and then saw them walking together on a residential sidewalk. I wanted to show my respect to his Dad as a military guy. I had good intentions but I have a slight suspicion I only succeeded in annoying the both of them more than anything else. As is consistent among mainland Chinese, they both put a good face on the exchange, but I’m about 98% certain the son would have strangled me near to death had his elderly father not been present. Like many of us, I am not really greatly familiar with the intimate history of the Korean War. But I do remember from my reading, that experts were against MacArthur’s planned landing at Inchon. So it is difficult to determine which expert is right at any given time. Which is why respect is due to those Generals who take responsibility and act in their best judgment. Hindsight is always easier. Plenty of folks objected to MacArthur’s island hopping to the Philippines. Lots of unnecessary bloody battles. The Navy and Marines island hopped straight towards Tokyo building B29 bases for the two bombs that ended the war. Ironic thing is I’m currently reading William Manchester’s magisterial biography of MacArthur, “American Caesar.” MacArthur’s Philippine campaign actually suffered very few casualties compared to what was going on in some of the battles in the European theater. In many cases he adroitly sidestepped heavier Japanese fortified areas and cut off supply lines. The Yalu debacle aside, MacArthur was a fine field commander and his conscientious rule over Japan right after the war is a classic of how to do things in the right way. The Inchon thing was strategically brilliant, operationally it was very risky. The risks were: was Inchon defended, was North Korean artillery available, tide tables were very tight. MacArthur went ahead, luck favored the bold in this case. US Marines grabbed a working port that could have been ‘bracketed’ by artillery, but was not. In the Bataan area MacArthur neglected ammunition and subsistence logistics! Maybe MacArthur thought the navy would interdict the Japanese, not knowing the technical issues the navy was experiencing with very widespread torpedo misfires. While keeping the air corps parked in clusters to prevent saboteurs costs his air power. The Torpedo misfire in this movie and the fix are not far from history. Naval Postgraduate School released a good paper on why you don’t pass a live fire test because you assume the failed test point was the anomaly. Einstein was consulted on the mechanical physics of the “firing pin” fixed in the movie. There is a legend among old army logistics officer, I once know that there was no anti freeze at Clark Airfield for the reciprocal engine airplane engines so they were overheating. The quartermasters at San Francisco said; “it is not cold in the Philippines” and pulled the shipment off the transports. The Korean affair was not a high point in MacArthur’s long career! US Eighth Army suffered for his ‘attitudes’. Walton Walker the 8th Army commanding general was killed in the operations pulling away from the Yalu. It would be interesting to know, the percentage of family members of U.S. soldiers (and South Koreans for that matter) who died around that area of Changjin Reservoir and the Yalu River, who associated or mentally connected their family member’s death with a completely unnecessary, dumb, and assumably “outside the chain of command” decision by MacArthur. The man is still lauded as a “great American” to this day. But how many of those families were ever made aware or educated on the fused-tight connection between MacArthur’s individual decision and those men’s deaths?? I wager, a very low percentage. The Chinese and North Koreans made their decisions and those deaths are their deal (in my opinion)—but the South Koreans and Americans deaths— related to this Changjin Reservoir deal—those deaths lie at MacArthur’s doorstep in my book. Ah, I don’t thinking ‘speaking truth to power’ is Kudlow’s thing. And I’m not sure he’s stupid enough to believe what he says in public. Not sure I can publicly say what that makes him, but I’ll bet your dad had a pungent Chinese folk saying that would cover his type. Willoughby was, apparently, (stupid enough) and wrote a thousand page hagiography showing it. There a certain mindset, imputing almost super-human powers of observation and understanding to the Leader, that flourishes in these situations and that, I think, is what all those claims that Trump is playing multi-dimensional chess boil down to. Maybe not but Stephen Moore really is that stupid. The Chinese retaliated right away, after we put tariffs on steel and aluminum. So, the arrogant communists won’t give an inch, like claiming almost the entire South China Sea. And we declared war on Japan the day after Pearl Harbor. Your name is PeakWilloughby. Separate issues. You’re not very good at compartmentalizing things when you think race is involved, are you?? Life is cheap in China, except for the communist elite (in more ways than one), and it has over 1 billion more people than the U.S..
PeakTrader: I’m unsure how this is relevant to the point that MacArthur-Willoughby made a serious error in ignoring data (captured Chinese soldiers) and outside (of Tokyo HQ) intelligence in assessing the likelihood of substantial Chinese intervention. Menzie Chinn, maybe, they thought as Americans, not communist Chinese elites. That is, Communist Chinese aggression. The U.S. infringed a little into Communist China’s huge trading advantage, slapping tariffs on steel and aluminum, and the communists retaliated quickly. The point is Communist China is willing to take much bigger losses than the U.S., like in the Korean War, because it values life as much as the Soviet Union. Enough of this stupid garbage. The Chinese are better at this than the economic morons you worship so they are likely going to win this trade war as Trump and his cheerleaders are even dumber than they are racist. Tens of millions Chinese people died in WW2. The Japanese invasions and some two hundred years of partial colonization of China by foreign powers left many thinking Chinese the realization that only way to save China and its people from total destruction is to take control of China and its people’s fate in Chinese people’s own hand, build a China that is strong to protect its people and prosperous to lift the lives of its people. The high costs for keeping China save and secured from hostile foreign forces were unavoidable due to China’s lagging behind in modern science and technologies then. Losing few hundreds thousands Chinese lives fighting in order to defend several hundreds of millions of Chinese people is a high price China had to pay to avoid millions more deaths instead. The current China is no longer so outgunned in any domain that any hostile power could get away without paying a very high price for any act of aggressions. It should be noted, the communists took control of China in 1949. Apparently, you’re privy to classified info the rest of us can only dream about getting. Peak, all the readers of this blog have been dying to know for awhile now, could you also identify for us when the Berlin Wall came down?? apparently peak loser has access to wikipedia! The main mistake Mac Arthur made was he underestimated the PLA’s fighting spirits and prowess despite being completely outgunned in air, on land and sea. It wasn’t a stretch to suggest that no one could have imagined the PLA could have a chance against the then world’s best fighting forces of USA plus several thousands of allies troops, fresh from victories in WW2. China’s intervention was preceded by repeated and clear warnings from China to UN forces not to cross 38th parallel. Similarly, the China India border war, China Vietnam war were all preceded with China’s repeated and clear warnings. So is the current trade war. “it has over 1 billion more people than the U.S.”. So? Yes China has 4x the population of the U.S. And California has 5.5x the population of Arizona. Oh wait – you prefer Arizona as a higher percentage of their population is white. Of course you kept dishonestly telling us people are fleeing California. The statistics will show otherwise but it would be nice if a lot of those non-white Californians left Cali to move right next to your lilly white residence in good old Arizona! trump has serious issues with black athletes. Is this related to the fact trump has small “hands” and they have very large “hands”?? Guess what? Trump is winning! ” The U.S. trade deficit widened in June for the first time in four months as exports fell and imports grew. Politically sensitive trade gaps with China, Mexico and Canada all increased. The Commerce Department said Friday that the deficit in goods and services — the gap between what the US sells and what it buys from other countries — rose 7.3 percent to $46.3 billion in June from $43.2 billion in May. U.S. exports slid 0.7 percent to $213.8 billion; imports rose 0.6 percent to $260.2 billion, led by increases in medicine and crude oil. For the first 3 months of 2018, the trade deficit was higher than that of the first 3 months of 2017. The second quarter for both years are similar even with that temporary soybean export boom. I bet the trade deficit for the rest of the year 2018 will be higher than what we saw for the 2nd half of 2018. Will the Trump cheerleaders admit to losing this trade war? Of course not – they will find something else to spin. They always do! Has Kudlow told Trump about this? Does Kudlow even know about this? Kudlow, PeakDishonesty, and Jay Sekulow are very much alike. “I had bad information” is Sekulow’s excuse for all of his past lies! In Peaky’s case – it is very bad information. Ah yes – Dean Rusk. The moron who gave us the Vietnam War disaster. PeakStupidity relies on the dumbest people as his experts. Communist China, after 1949, is much more aggressive than pre-1949 China, and difficult to assess in 1950, given so little history. If a war could stop further and bigger wars and bring decades of peace for China, it is a worthy war in the eyes of China leaders. history shows the “experts” on korea and china back in the days of the war were incorrect. decision making was based on inaccurate information provided as a means to appease those in power. how is that any different today on the economic front, with guys like kudlow and moore filtering through only pro-trump and pro-tough guy soundbites to the president, to appease the bully in chief in his trade wars? you really think “goldilocks” kudlow has any interest in reviewing and acknowledging information that may not create his desired spin? I appreciate that Menzie is frustrated with the discussion here, which has irrelevantly focused on MacArhur. But then Menzie seems to be a bit off here. it is unclear that Kudlow is Willoughby in this current scenario, although it is also unclear that he is doing anything to offset the real Willoughbys. Those would seem to be Pater Navarro Number One Willoughby followed by Commerce Sec. Ross, with Trade Rep. Liighthizer a third. Kudlow looks more reasonable than any of them, and limited as it was does seem to have played a role in getting Trump not to impose auto tariffs on the EU, against the mass advice of the Gang of Willoughbys. Frankly, this whole thread has been off, although all of you arguing over MacArthur are just completely out to lunch playing irrelevant history games. I slightly modify my last comment. I now see this public statement by Kudlow downplaying China’s ability to respond. So, yes, he is publicly playing Willoughby, although it is unclear there is anybody in the admin pushing back against this tide that Trump clearly favors, certainly not the three people I mentioned, who are further into war with China than Kudlow, especially Navarro, who was shouting at Mnuchin in front of Chinese negotiaters in Beijing a few months ago. Maybe Mnuchin is the voice of reason, sort of. And, in case anybody does not know, China has more means to retaliate than just trade barriers, which would on the surface seem to favor the US. They can do what they did to the South Koreans not too long ago, institute consumer boycotts against US companies operating in China. It is speculated they are holding back on that for now, both to be a last resort and also because those are hard to control or stop once unleashed.